Two drivers merge onto northbound MoPac. Sometimes, people are the worst. If you want proof of that, sit in traffic. Congested roadways always seem to find a way to shine a light on the wanton, asphalt-black recesses in the hearts of drivers. We've all been there: stuck in a line of traffic near a lane closure or an on-ramp, when a car zooms ahead to cut in front of everybody. It's infuriating sure, but what if that scofflaw is actually ahead of the curve? The idea is that when multiple lanes merge down, drivers are supposed to go all the way to the front of their lane. The hard part is, whether you're in a continuing lane or the merging lane, you’re supposed to let someone else ahead of you. In other words, use all of the available lane space and merge at the last minute, like a zipper. It’s a more efficient way to merge – in theory, but why? In these situations, folks get nervous and tend to merge early. Robert Brydia, senior researcher at the Texas Transportation Institute at Texas A&M University, says this strategy runs counter to a lot of research. 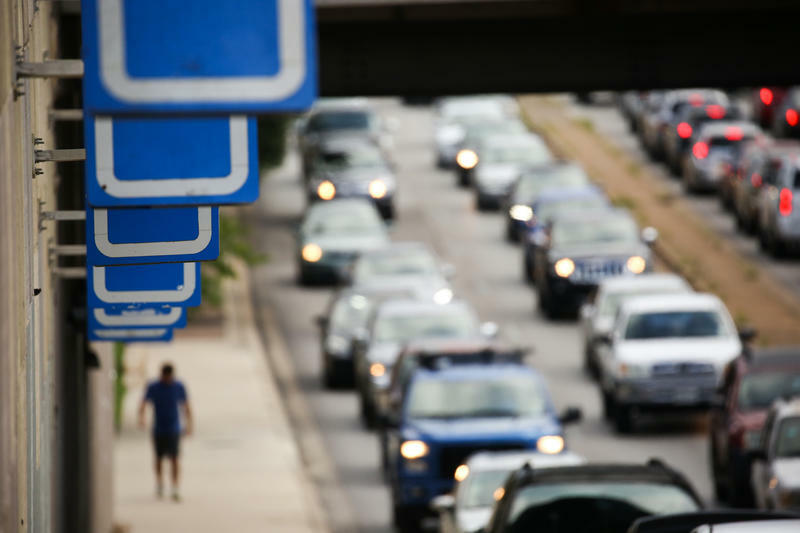 For example, if there's a queue – that's transportation parlance for a line of traffic – that's 2 miles long, the late merge – that's transportation parlance for a zipper merge – goes a long way in busting up traffic. "If you could utilize all of the available capacity, then your queue is only 1 mile long," Brydia says. "And, typically, the 1-mile long, with people alternating and taking turns … flows much more efficiently than the queue that is 2 miles long and growing." The late merge has a long track record of cutting down on congestion in states that have pushed the technique. A 2008 study by the Minnesota Department of Transportation found late merges cut traffic by half on some merging roadways in the Land of 10,000 Lakes. Traffic is rage-inducing, obviously. But the level of rage is often dependent on the dynamics of that traffic – whether it's moving or the length of a queue, for example. Brydia says late merges alleviate some of the rage by moving traffic along at a clip. “Emotions tend to get higher in a stop-and-go situation than they do in a ... situation where everybody’s being told to share, play nice with your neighbor, everybody’s moving, everybody’s going to get through type of deal," he says. “People generally respond better just in a traffic situation when they’re moving – even when it’s at a slow speed. But if they’re making progress and moving, human behavior is: OK, life isn’t all that bad." All of this is hindered, naturally, by the limitations of folks behind the wheel. To a lot of drivers, it doesn't feel natural to drive all the way up – essentially cutting off an entire line of cars (and implying your time may be more important than theirs). But the late merge system works efficiently only if there's a large-scale public buy-in. So, technically, the natural reaction to curse an errant driver who cuts in a line of traffic isn't all wrong, but neither is the urge to cut off an entire line of cars. "Human behavior is to utilize the available space that there is, and having a big, open lane is kind of contrary to thoughts about how the roadway should operate," Brydia says. "So, it’s basically trying to utilize the available capacity of the roadway up until the point where it is reduced, which is right at the lane merge-point." Still, obviously, those drivers who cut ahead – they're called queue-jumpers in transportation parlance – gum up the works, because they're met with a less-than-rosy reception by drivers at the merge-point, which causes delays and sideswipe crashes. At the same time, the folks who abide by the urge to merge early also cause hiccups in the flow of traffic. But, if folks used the late-merge tactic en masse, there'd be less friction. "It’s an education issue, though, really," Brydia says. "It’s something new for the drivers. You know, what you’re trying to reduce is those shockwaves in the traffic streams ­– shockwaves cause accidents." Good morning. I'm Steve Inskeep with world traffic news. Picton, Australia, suffered major delays when two drivers confronted each other on a one-lane bridge. Both felt they had the right of way. Neither yielded for half an hour.